HOOP FANS. 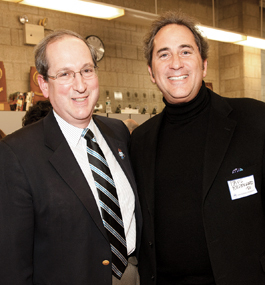 President Fred Lawrence and Paul Rosengard ’80 (right) were among the more than 400 Brandeis alumni and friends who watched the visiting men’s and women’s basketball teams split a pair of games with host New York University. Josh Ostroff, P’14, won his bid for re-election for a third term as a selectman in Natick, Mass., where he has lived since 1988. “I’m thrilled because I love serving the people of this town, and it’s an honor to have their confidence to serve on the board,” Josh told the MetroWest Daily News. Josh is president of Virtual Media Resources, a research company in Natick. Bob Romeo, the girls’ basketball coach at Masconomet Regional High School in Topsfield, Mass., was named Coach of the Year by the Salem News. During his 10 years as coach of the Chieftains, they have a 177-48 record. The team lost to eventual state Division 1 champion Andover in this year’s regional final.Bob played basketball at Brandeis. His daughter Danielle is one of his assistant coaches. Deborah Halber is working on her first book, which is due out next year. Tentatively titled ”The Skeleton Crew,” the book tells the story of amateur sleuths who use information freely available on the Internet to solve cold cases involving unidentified human remains.